Opus is first and foremost a human journey, which began in 2001 in collaboration with independent watchmakers. It is a journey that Harry Winston shares with the most passionate collectors of extraordinary pieces. 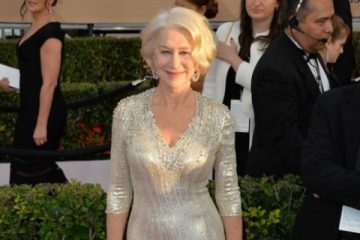 In 2015, Harry Winston Timepieces has written the fourteenth chapter in this unique saga. By partnering with Franck Orny and Johnny Girardin, two visionary watchmakers, the brand provided an exceptional chance to push the limits of the imagination even further. It all began with a blank slate on which to design a totally original timepiece. Code name: Opus 14. 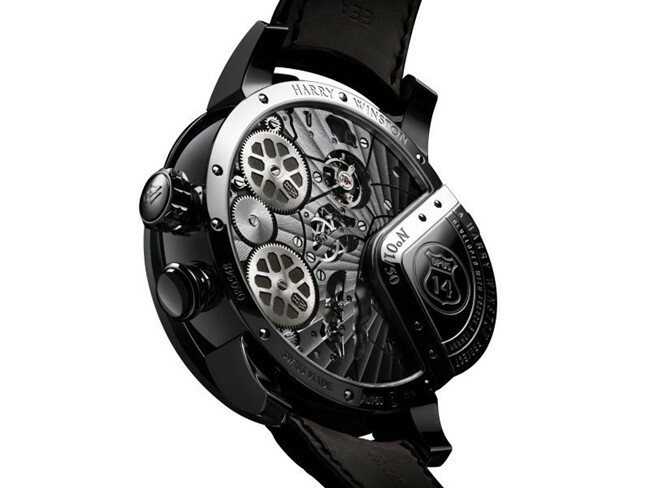 Opus 14 combines the best in mechanical innovation with a remarkable playfulness. The model’s silhouette is an ensemble of visual surprises brought together beneath a sapphire crystal cut from a single block and housed within an 18K gold case measuring 54.7 mm in diameter. In both its design and its automaton complication, this new creation evokes a jukebox, the mechanics of which have been miniaturized. 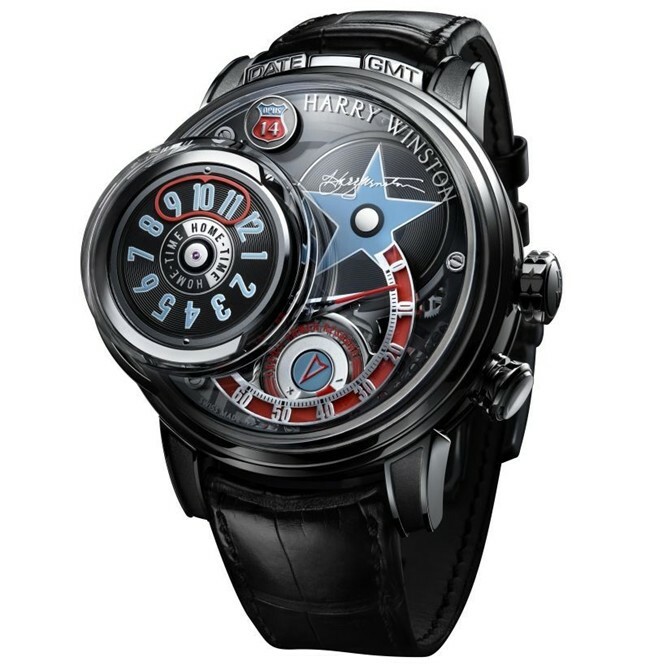 The soul of the Opus 14 is shaped by each detail: the stylized display of the local time at 9 o’clock, the vinyl-style finishes on the various dials, the two-toned insignia bearing the number 14, the shaded red of the retrograde minutes arc, the style and blue tone of the hour markers. These elements recall the rock ‘n roll era and the emblematic diner aesthetic, as well as the legendary Route 66. This spirit also infuses the presentation case, itself inspired by the jukebox. 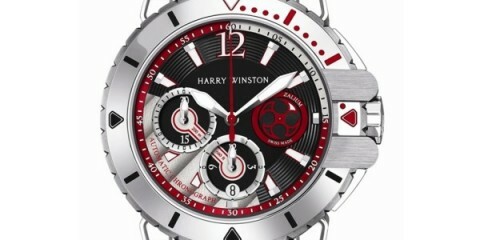 The miniaturization of the jukebox mechanism is a first and has been patented by Harry Winston. 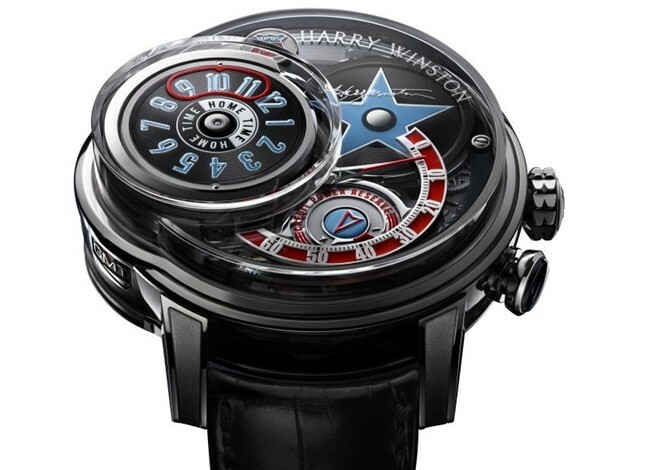 It reveals four disks housed in a store, each showing a specific display: local time, GMT time, the date and a star bearing the signature of Mr. Harry Winston, a reference to the stars of the Hollywood Walk of Fame. Activating the selector, located at 9 o’clock on the edge of the case, chooses the desired display. This action sets the entire store into an up and down motion, thus freeing the selected disk. When pressed for the first time, the push-piece at 4 o’clock activates a moving arm that picks the disk up and sets it onto the platform to be read. While the disk displaying the local time remains in place at 9 o’clock, the chosen GMT, date or star disk is positioned on this platform. Pressing the push-piece a second time once the disk is in place reactivates the arm, which moves the disk back into the store. The complexity of the movement, exclusive to Harry Winston and the identity of the Opus collection, lies in its two distinct power reserves. 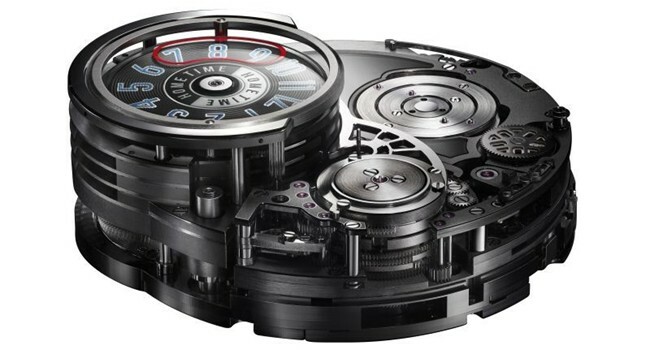 One ensures up to 68 hours of timekeeping autonomy; the other guarantees up to five back and forth disk movements. Although the power reserves are separate and function independently, they are driven by a shared winding mechanism. 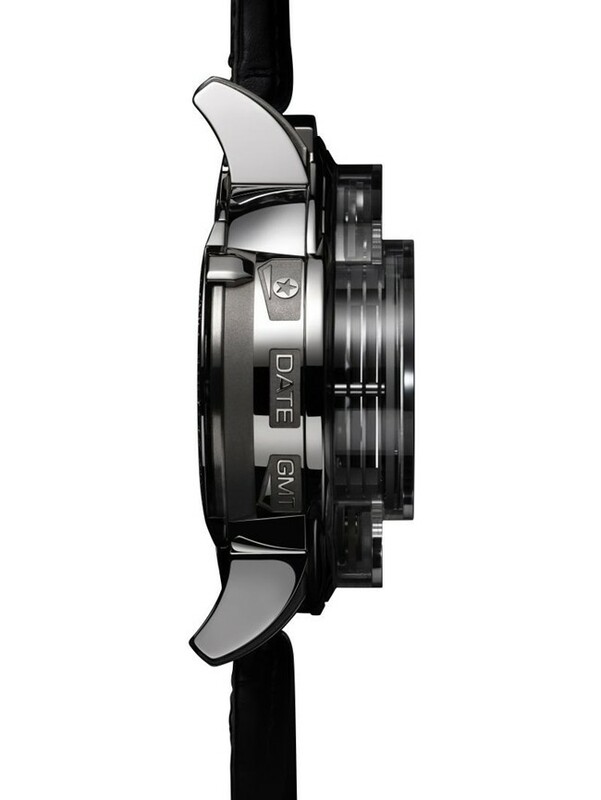 In addition, the push-pieces on the lugs at 12 o’clock allow the wearer to correct the date and GMT. Limited to only 50 pieces, the Opus 14 fits in perfectly to the series of exceptional models that is the Opus saga.